Asset management and pipe condition assessment (CA) activities in the water industry usually require locating buried pipes accurately to minimise inspection and maintenance costs. A typical challenge in practice is locating an anomaly detected by an in-pipe inspection tool from aboveground in order to dig up a pipe for replacement. Accumulated in-pipe errors over longer distances in particular can easily lead to selecting the wrong pipe section for further investigation or exhumation. In fact, some in-pipe CA providers suggest utility personnel dig up a number of sections of pipe around the suggested location so as to ensure finding the target section. 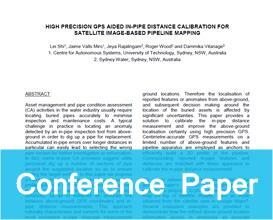 In this paper we propose a mechanism to accurately correlate a 3D pipeline profile built from GPS surveying results of aboveground pipeline features with in-pipe chainage distances, so as to establish an accurate link between above-ground GPS coordinates and inpipe distance measurements. This approach naturally characterises and corrects for some of the most prominent in-pipe chainage measurement errors that can lead to uncertainties about the reported location of a buried pipeline from aboveground. The detailed pipeline information can then be projected onto satellite imagery as an accurate easy-to-understand reference for efficient decision making. In August 2011 international water research organisations, Australian water utilities and three Australian universities came together through a collaborative research agreement, and committed overall funding of $16 million (including $4 million cash) over five years to undertake this research through the Advanced Condition Assessment and Pipe Failure Prediction Project.